The roulette game consists of two main parts. One of them is the roulette wheel and another is a roulette table. Why is the table so important? Well, because it is the place where we make the bets. Also it has a layout - the main thing that makes a difference between it and other tables. The casino roulette table is usually made of wood and cloth. The cloth is used as a covering. The classic variant of the color is green. Although, there are other colors available, like red, black, grey, but among the casinos the green one remains to be the best choice. The usual material the table cloth is made of is baize, or felt, which is the same material but another word in American English. It is a thick material, which is also used for the billiards, as it is not very soft, but good for rolling the ball. In our case nothing sticks to it. The usual playing area is 180 x 90 cm. If you are interested in having the roulette table at home, you can actually make one. Just check out the steps you need to take. While playing the roulette game, you should also pay attention if the table is well-balanced. As the roulette wheel is attached to it, it can lose its balance, because the bigger part, the table, is a bit shaky. There are many gambling superstitions, which concern the wheel and the table. It is like all the roulette tables are the same, so you can use mathematics to beat the system. But you should not believe in those "secrets" of winning in the roulette game. Casino myths remain to be the myths, even if they sound very realistic. It is a matter of what we want to believe in. 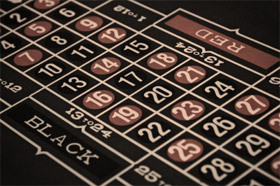 There are two things you should be sure in - roulette wheel and roulette table, the fact that they are not biased. Period. Fresh ideas on the roulette game are located on roulettedoc.com. You are welcome to read, enjoy and apply them!